The 10 Best Playgrounds in Michigan! 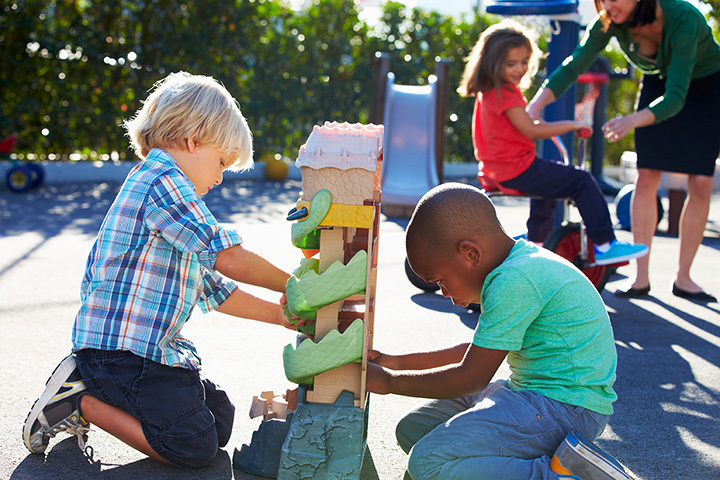 Playgrounds serve as the perfect place for children to expend energy and unleash their imaginations. And playgrounds aplenty exist here in Michigan, and most every elementary school in the state boasts one. There are some absolutely incredible playgrounds in Michigan beyond schoolyards, though, and these 10 are the very best! At Milham Park, you’ll find two separate play structures, one for the older kids that includes ziplines, tunnels and more, and one for the younger set. Meanwhile, a 50-acre park with plenty of shade trees ensures that the older folks will have plenty of time and opportunity to relax while the kids play. Shelby Township's Stony Creek playground offers a wide range of options for the kids to enjoy. The old days of the fireman's pole are gone, for example, replaced with an “elevator-style” pole that features hydraulic lowering and an automatic reset once the kids step off. Throw in a jungle gym-esque function made entirely of elasticized ropes and you have a great place for children to play! One of the greatest features to be found in Houghton is Chutes and Ladders, the popular name for a playground attraction unlike most you'll find around. Chutes and Ladders is a massive wooden play structure built like a sprawling pseudo-castle that packs in plenty of exactly what its name suggests is there: chutes, or slides, and ladders. Leave aside this wooden wonder, it's also got Lake Superior right on its borders, so swimming actually becomes possible, along with cooling lake breezes to keep kids from getting overheated. South Haven's Kids Corner makes its own push on the castle playset theme. Containing a massive wood structure with plenty of climbing and sliding elements involved, Kids Corner offers the full range of options. Plus, the minor details haven't been overlooked here either, as there will be plenty of shade and benches for visitors to enjoy, and all of it just feet from Lake Michigan, another point in this playground's favor. Hit Fraser's Steffens Park to check out one of the biggest names in castle-style play structure around: Fort Fraser. Granted, as the name suggests, it's more a fort than a castle, but there's plenty of opportunity for imaginations to run wild here. Slides, swings, monkey bars, sand digging cranes, and more await every rambunctious tot you know here. Safari Playground in Walled Lake is a little something unique. Built especially for rainy days—but good pretty much any time—Safari Playground is a jungle-themed indoor playground. It's actually a complete family fun center—laser tag, video games, the whole nine yards—but the central feature here is the indoor playground, complete with bridges, slides, and everything else that would give even Chutes and Ladders a run for its money. Throw in the fact that it's indoors—and thus available when any other playground would be out of reach—and the value inherent here shines through. If you're in Dearborn, and planning to check out Greenfield Village anyway, then spare a thought for the Donald F. Kosch Village Playground. Eminently accessible for the disabled, and with a single entrance in and out for maximum safety, the playground boasts a particular historical bent that's hard to pass up. It's built like a 1930s construction yard, complete with cranes, water towers, and other attractions that have been converted to playground fodder. The Brighton Imagination Station offers 10,000 square-feet of space for your child to run wild. An array of swings, even “bucket-style” swings for the younger set, as well as slides and a fortress-style play structure round out some of the offerings on hand in this massive playground. Just to top things off, in a stroke of brilliance, not far from Brighton Imagination Station is Oh My Lolli, a candy shop specializing in lollipops that can put a sweet end to an already sweet day. Frog Hollow Playground ranks high among Michigan's playgrounds thanks to its accessibility. It's geared toward children both with and without disabilities, which makes it fun for most any child. With several different play structures like slides, balance beams, and various frogs—there are also telescopes, which make for some extra fun—Frog Hollow is also an enclosed playground, which means one entrance/exit point. That provides a little extra safety for the kids, and peace of mind for Mom and Dad.